After some thought about my lack of sound gear for my recent Artwalk gig, I have come to a conclusion about the kind of setup that would have worked better. My friend Pete has a Yamaha EMX5014C powered mixer that he uses for his trio band gigs. It has a collection of essential and useful features onboard on all built-in. Since it is self-contained, it is easy to transport to the small gigs where a larger system is just overkill. This mixer would have been totally perfect for the gig that I was part of. The EMX5014C mixer has 8 mono inputs, 2 stereo inputs, stereo 9 band graphic EQ, SPX effect processor, 2 aux sends, and 500w + 500w of amplifier power available to the mains outputs. There is also selectable amplifier routing allowing custom setup of the power amp channels in the configuration that works for the gig. It can be set to basic left and right mains out, or left/right on one channel with monitor on the other, or both outputs setup for monitor sends. In addition to the powered outputs, there are also other line level outputs that bypass the internal power amps. Left and right mains outputs, Aux 1 and 2 monitor outputs, and Left and Right Sub outputs. These external connections allow you to connect the mixer to external amp racks or to separate, powered loudspeakers for larger setups. Now, for the gig I just worked on the street, I could have easily down it with the Yamaha EMX5014C mixer. Everything would have been available onboard and the separate amp rack would not have been required. The only drawback I can see is if something goes wrong with one part of the powered mixer, you can't just swap out the piece of gear like you would with a component system setup. With the size of gigs I usually work, I would be able to get away with using a powered mixer for most gigs and then adding separate power amps for the larger shows. That is as long as I have enough channels for the show. 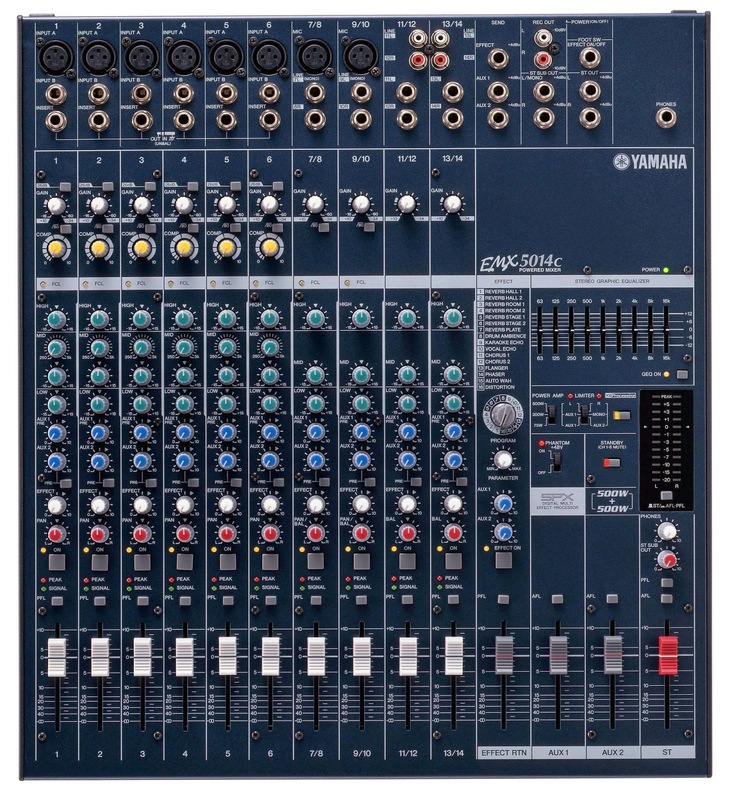 I used the Yamaha EMX5014C as and example of a good powered mixer. Of course, there are other companies making great powered, desktop mixers out there. Allen & Heath, Mackie, Peavey, Yorkville Sound to name a few. There is a cost difference with a powered mixer compared to a passive mixer + power amp setup. There is also the portability issue with all the extra gear using a passive mixer. Another option now is the advent of powered loudspeakers that can be easily used with any kind of passive mixer eliminating the needs for separate power amps with the system. There are many things to consider when buying a powered mixer over a passive mixer with separate amp. Determine the complete use of your sound system and make an informed decision when out shopping for a sounds system. Happy hunting! Too Old To Start A Business?